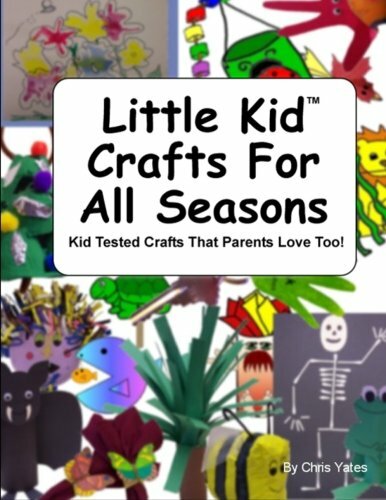 Chris Yates Little Kid Crafts For All Seasons: Kid Tested Crafts That Parents Love Too! Little Kid Crafts For All Seasons: Kid Tested Crafts That Parents Love Too! Discover how you can quickly and easily get simple, high quality, little kid crafts guaranteed to ignite your child's imagination and thirst for learning without pulling your hair out! This secret weapon for the children's crafts industry has been used by thousands of parents and caregivers all over the world in ebook form, and now it's available in print! Each craft project adjusts to Your Child's skill level so you can keep them involved in the project, instead of doing it all for them. Ideas for building in learning opportunities presented with most projects -- never miss a chance to get a little learning in with your craft. Pictures of completed projects, clear step-by-step instructions and diagrams, and templates and patterns make crafting a breeze. Easy-to-follow project types to make choosing a craft simple. Complete supply lists with each craft to ensure you have everything you need on hand before you start -- No surprises! Crafts are made from household, recyclables, and readily available materials, making crafting inexpensive and fun! Suggestions for adding other materials to your projects to increase their difficulty, make them more engaging, or create a sensory experience -- Create totally custom crafts! Learn how to make projects like a Toilet Paper Tube Frog, Silly Summer Hat, Corner Cat, Easy Butterfly Napkin Ring, Scarecrow Stick Puppet, Handprint Hermit Crab, Paper Bag Bee, Flower Blow Painting, Handprint Key Chains, Q-Tip Skeleton, and much more! This book is sure to become a favorite you'll refer to again and again!